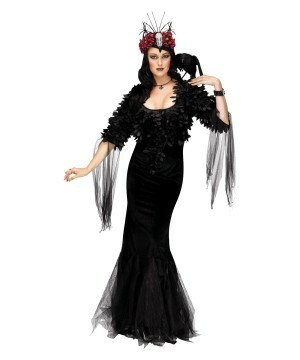 Womens Raven Mistress Costume. Includes black floor length gown, feather-inspired black shrug with flowing strands of tulle on the sleeves, flower headpiece with skull detail. Available in womens sizes Small 6-8, Medium 10-12, and Large 14-16. Become the gothic ruler of darkness and master of ravens with this elegant costume. The form-fitting gown with flowing detail gives a touch of mystery to the ensemble and the flower headpiece makes for the perfect accessory. Just add a dark wig and the look is complete. Review(s) for " Womens Raven Dark Mistress Costume"